There has been a lot of buzz about teaching with memes, but before you jump in, it’s important that you understand what memes are, and how they can be used as powerful tools for teaching argument, rhetorical analysis, and more. In world of behavioral research, the term “meme” is typically used to describe any thing that is imitated and passed on from person to person. In this sense, a hand gesture can be a meme… a catchy song can be a meme… singing “Happy Birthday” can be a meme… and so on. If you’re interested in this topic, you might want to check out Susan Blackmore’s book, The Meme Machine. But, when your students talk about memes, they aren’t referencing scientific research, and they aren’t talking about hand gestures or mannerisms. They’re talking about something else – something more deeply embedded in popular culture and the Internet. For your students, and for our purposes, a meme is an image, video, or text that is spread rapidly by Internet users. Memes are usually humorous, and are often copied with slight variations. 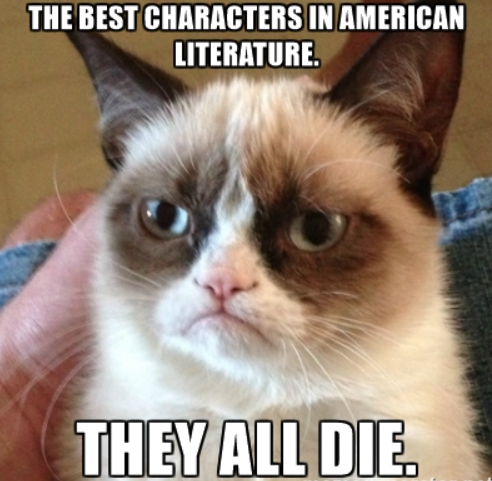 While there are many to choose from, a popular example is the “grumpy cat” meme. You may recognize grumpy cat, pictured on the right. A few more words of caution before you begin teaching with memes. Memes can quite often be vulgar and/or inappropriate for school. This makes sense. Think about some of the best TV series that you’ve watched, or the funniest comedians that you’ve listened to. School appropriate? Probably not. But that’s no reason to keep all memes out of your classroom – rather, it’s a good reason to be vigilant about how you treat memes. Should you perform a Google Image search for memes while projecting your computer screen to the entire class? No, of course not. Should you send your 8th graders looking for the most popular memes on the web? Nope, definitely a bad idea. In most circumstances, you’ll want to provide the memes yourself and control the environment as much as possible. There are plenty of meme generators that you can use to create your own memes for your classroom. net was used to create the GrumpyCat examples in seconds. But, once again, MemeGenerator.net is also littered with content that is inappropriate for school. Tread carefully! All of that being said, memes offer a lot of power in that they are literally built from the stuff that student engagement is made of… memes are designed to go viral, and can have similar effects in your classroom. Now, if you’re teaching argument and rhetorical analysis, great questions to ask would be – Why? From where do memes derive their rhetorical power? And are they effective vehicles for the arguments they carry? Not sure where to start? Check out these materials for teaching argument with memes! ← 10 Unexpected Texts To Analyze: #NCTEchat’s Top Picks!